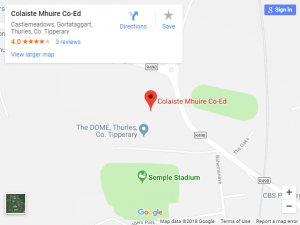 Here at Coláiste Mhuire Co-Ed, there has been an overwhelming response to the setting up of the Green Schools Committee in October 2012. The first flag that we will be hoping to achieve at the end of this year is the flag for Litter and Waste. Litter is a visible problem; both students and the local community will notice improvements in the appearance and image of the school. It is a good starting point for encouraging a sense of personal pride and responsibility. We are rolling out a competition to come up with a slogan to underpin our campaign and to design a mascot which will reflect what we are trying to achieve. The response has been phenomonal. Stay tuned to the website for further updates regarding our progress and remember, this is our school to be proud of!! The action day for the Green schools first green flag will be held on Tuesday 23rd April. This is a whole community initiative involving the students, staff and parents. It will provide a wonderful opportunity to clean up our local environment. The action day is an essential activity in order to achieve our first green flag. Everybody involved will be provided with litter pickers, gloves and hi-vis jackets. Spirits are high as the excitement and enthusiasm builds. 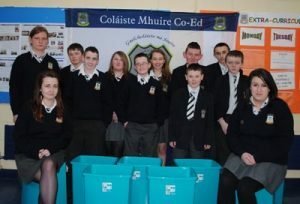 Well done to the Green schools committee, led by the Chairperson, Rachel Stapleton. A big thank you to Deirdre Cox, Environmental Officer for North Tipperary Co.Co for all her support in this venture. The green schools’ committee has increased their commitment in their quest for their first green flag. They have purchased green recycling bins which will be put into all classrooms and all social areas. The support from the rest of the school body has been phenomenal and already, the amount of recycling has increased exponentially and the amount of waste had reduced dramatically. The competition to find a slogan for our first green flag is underway. This slogan will underpin all of the work carried out in relation to litter and waste. The standard of entries is excellent and there will be fantastic prizes for the winner. We are also looking to create a mascot to accompany the slogan. So students, let the creative juices flow to help our school become a cleaner, greener school.